It just so happened that I have ceded the review of Haunt Luminous Eyes to my colleague Andy … and then I promptly missed two full-lengths by this young band which grew originally as a one-man project started by Beastmaker’s Trevor William Church. 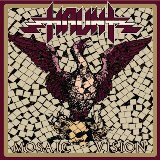 Back to doing it in EP format, Haunt is now blazing the path with the new offering Mosaic Vision on oh-so-fitting Shadow Kingdom Records. The new EP has Haunt push very much into the same direction as what I remember from Luminous Eyes. However, their NWOBHM/traditional heavy metal is a lot more full-bodied now (no wonder, with a full-fledged lineup the sound like this is easier to produce), yet at the same 80s style riffery is softened by a touch of 70s psychedelia. Mosaic Vision has very compact and quite standard verse-chorus-versus-chorus-breakdown or solo-chorus song structures. The compositions are straightforward, immediate and hit you in the face from the first note. The riffs are obvious (title track), galloping (In Show of Flames) with hooks being very memorable, something you recognize, comprehend and want to play on repeat over and over (In Show of Flames). Guitars are fluid, and very much in front of everything else, just like on the solo of (title track), which is very much a Haunt feature. At the same time this is no dry copy of pre-80s metal. A quick synth touch in the middle of Triumph, moaning vocals, especially on Callouses is what brings the 70s psychedelic atmosphere on. Callouses starts out almost glam-like, King Kobra in some ways, but soon gets refuted by thrashy rhythms and guitar solo. I am a huge fan of EPs, and this is one to behold and enjoy. In Show of Flames is my favorite song, a lost Judas Priest song from the pre-British Steel era.